By Duke Ellington. By Duke Ellington (1899-1974). Arranged by Rick Stitzel. 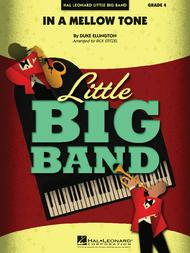 Little Big Band Series. Swing, Standards. Published by Hal Leonard (HL.7012283). Nobody could swing like the Duke! Here is his medium swing standard In a Mellow Tone skillfully arranged for the six-horn format that also includes solos for trumpet and alto sax. The shout chorus is written with striking dynamic contrasts for added effectiveness.